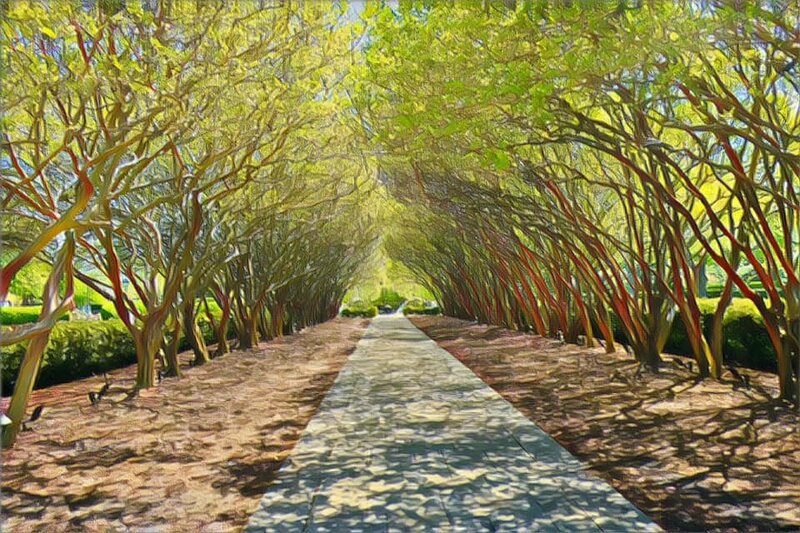 One of my favorite places at the Arboretum. The Myrtles are the last to leaf out in the Spring. This is just beautiful! Such a peaceful sight! Wow very cool shadows and tree lined pathway! Love your editing, a bit 'Van Gogh'. Fav. Beautiful shot and cool processing. What a great place. And I love your processing! Very pretty with all the light and shadows. Your choice of processing makes it look like an impressionist piece of art. Amazing tunnel of trees. Love the processing! such a lovely capture, law. aces! Very pretty- It must be lovely to walk through that. @beryl @sunnygirl @ziggy77 @radiogirl @pistache @gijsje @mittens @ingrid01 @pamknowler @carolmw @pcoulson @grammyn @happypat @summerfield @snowy @carole_sandford @nicolecampbell @olivetreeann Thank you so much for your lovely comments and faves. This is on the TP and PP because of you! I will have to take a photo when the Myrtles are in full bloom, you will love it! Stunning tunnel of trees - love your processing of this. Be sure to take those myrtles when they bloom. Bet it's gorgeous. so beautiful, a lovely avenue of trees.